If your computer desktop looks anything like the above, you need to read this article. Not only are you slowing your computer down, but you are also slowing yourself down and hurting your productivity, because more clutter = less focus = less productivity. Now, I know there are moments when you are “in the zone” and simply don’t want to disrupt your workflow by saving files properly. But if your desktop is always cluttered, it’s not a reflection of your creative state, but rather a reflection of your indecisive, lazy self (yes, yes I’m being harsh, but I’m only trying to help.) So let’s clean up the clutter, shall we? 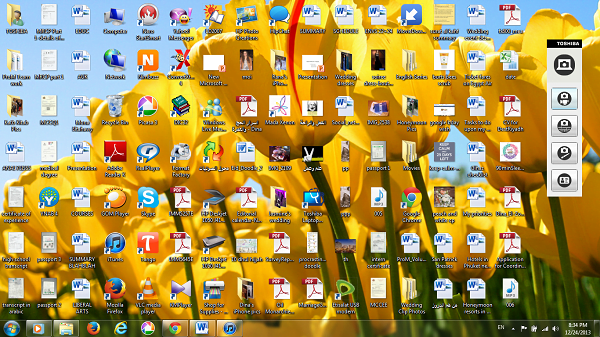 First, let’s look at the root cause of having a cluttered desktop: Why do you have a cluttered desktop? 1. Laziness: Develop a habit/routine where you do NOT save a single file on the desktop, no matter how busy you are. You’ll always save the file in a specific folder. 2. Fear: You need to trust the “Search” functions of your computer and develop a clear naming/filing convention that’s logical to you. The above are preventive measures to stop you from getting yourself to a cluttered desktop. But what if you already have a cluttered desktop? 1. Dump ALL your desktop files into one folder called “Archive”, which you have under your username account. 2. Create the logical naming/filing convention you’ll follow from now on. 3. Every weekend, spend a few hours moving files from your Archive folder to the right folder. 4. Stick to the habit of NEVER saving a single file on your desktop. If the above steps seem difficult, try using any of these desktop declutter tools here: http://www.freewaregenius.com/ten-free-tools-to-better-organize-your-desktop-icons/. If you are seeking to organize other physical spaces like your work desk or wardrobe, you may want to revisit this article. Now, trusting you to clear your desktop is going to be hard unless you prove it to me. So, I want you to share your “Before” and “After” screenshots of your desktop in the comments below so that I know you’ve overcome your laziness and fear ;).